The old joke about Montauk, and really about most fishing villages, is that they are quiet drinking villages with slight fishing problems. But that joke just isn’t funny or even true this summer for people who live in Montauk, which has just tipped the scale from a place to go to have a little fun to a place where half-passed-out revelers from out-of-town are wandering aimlessly in the street, openly doing drugs in clubs, blocking emergency traffic and otherwise just making life hell for people who call Montauk home. 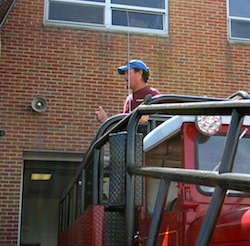 Taking out the brush truck to make room for the people. There weren’t enough chairs for everyone, so firefighters implored the able-bodied to let those who needed to sit have the chairs. Montauk has been up in arms since this Fourth of July weekend, which saw an unprescidented level of bad behavior, from drunken revelers relieving themselves in backyards and hotel hallways to an accident that left one young Mattituck man on leave from the Navy in a coma when he was struck by a taxi when trying to cross Montauk Highway. That young man, Benjamin Pileski, just awoke from the coma yesterday. 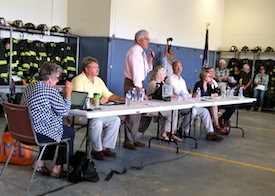 Several hundred residents showed up at East Hampton Town’s monthly work session at the Montauk Firehouse Tuesday morning to express their concern over what’s been happening in town. The crowd was so thick that the town board decided against holding the meeting in their usual quarters in the fire department’s upstairs meeting room, and instead enlisted the help of firefighters, who cleared out the firehouse’s truck bay to accommodate the crowd. The mood in the room was one of respect and mutual solidarity as both members of the public and town leaders said they want to clean up the mess of Montauk’s party scene. Town Supervisor Larry Cantwell and Police Chief Michael Sarlo began the meeting with a lengthy account of the problem and possible solutions, before taking more than two hours of public comment. “I’m very heartened that so many people are here,” said Mr. Cantwell, who added that he believes the behavior of visitors to Montauk has become “outrageous” and “clearly requires prompt and forceful action” from the town. Town Supervisor Larry Cantwell addressed the crowd. He added that the town will work with the county health department to cite businesses that exceed their occupancy under the county’s sanitary code. He also plans to ask the county to put no parking signs on county-owned Edgemere Road near the Surf Lodge, one of Montauk’s most frequently overcrowded night spots. “This is not an attempt to put anybody out of business,” he said, adding that businesses should work with the town to be good neighbors. Mr. Cantwell told the crowd that he’d welcome a public discussion of perhaps banning amplified outdoor music and banning drinking on beaches, as well as establishing a rental registry to keep track of overcrowded party houses. He said the town could also look into “compulsory termination” of non-conforming nightclubs. How to fix this within the limits of the law? Within the limits of the Town budget? And without strangling the Town’s economy? The Town can serve summonses for code violations, but can’t just close down a bar. The bar can fight it in court. Remember the dance the Surf Lodge did a couple of years ago, and Cyril’s? They settled their issues for a fraction of the cost and still go on as before. Parking restrictions on Edgemere are probably necessary for emergency vehicles. Rental registry will hurt responsible homeowners and the irresponsible will ignore it. Plus, who wants the Town snooping around your house? Nancy wants portapotties (“the nice kind”) but she must not have any idea how much they cost to maintain. You can’t force a bar to pay for them on public property. But if there are too many patrons for the bar’s plumbing, isn’t there a way for the Town to mandate that the business add them? I know there’s environmental limits on a septic system (I fear Fort Pond is threatened by the Surf Lodge), but does that extend to portable systems? Maybe the back door way to do that is to significantly increase the fines for code violations for recidivists. Ban taxi’s from operating in Montauk after 1AM on weekends. Force establishments to stop serving alcohol by 1230AM..